This British teenager who bears an uncanny resemblance to Sherlock Holmes star Benedict Cumberbatch has become an Internet sensation, thanks to a few selfies he posted to Instagram. 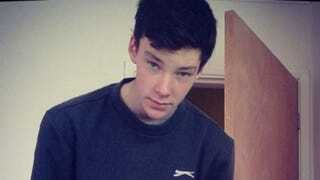 Tyler Michell, 16, began posting selfies to Instgram tagged #benedict #cumberbatch #sherlock #holmes #batch etc. and instantly gained a legion of swooning followers. It hasn't been all fun and games for Michell, though. His images quickly went viral among Cumberbatch's legions of notoriously exuberant fans in China, who inundated Michell's Instagram page with comments and questions. In a post he seems to have deleted, Michell (ill-advisedly) wrote "Chinese followers. Stop commenting on all my stuff." (Oh dude, no. Just no.) That was met, unsurprisingly, by a swarm of angry backlash. He's since tried to explain himself and with his account still active, he seems to be trying his best to handle his new found "fame," as it were. Personally, I'll go with the real thing.